Far from the semis places last season, Sisi Rondina and the Tigresses now have a shot at a twice-to-beat advantage. UNIVERSITY of Sto. Tomas made short work of Far Eastern University, 25-23, 25-18, 25-23, on Sunday to boost its chances of taking a twice-to-beat advantage in the Final Four of UAAP Season 81 women’s volleyball tournament at the MOA Arena. The Tigresses scored their ninth win in 13 outings, taking solo third and closing in on La Salle, which holds a 9-2 record. Rondina led the charge with 21 points for the Tigresses, who have made a huge improvement after winding up seventh in Season 80. UST and FEU completed the semifinal cast before their match as University of the Philippines bombed out with a five-set loss to also-ran National University. The Lady Tamaraws, who entered the match tied for third, slipped to fourth with an 8-5 card. Rondina led the charge with 21 points off 17 kills, three service aces and a block laced up with 15 digs and 12 excellent receptions, while Laure delivered 13 attacks, three aces and a block for 17 markers including 14 digs. 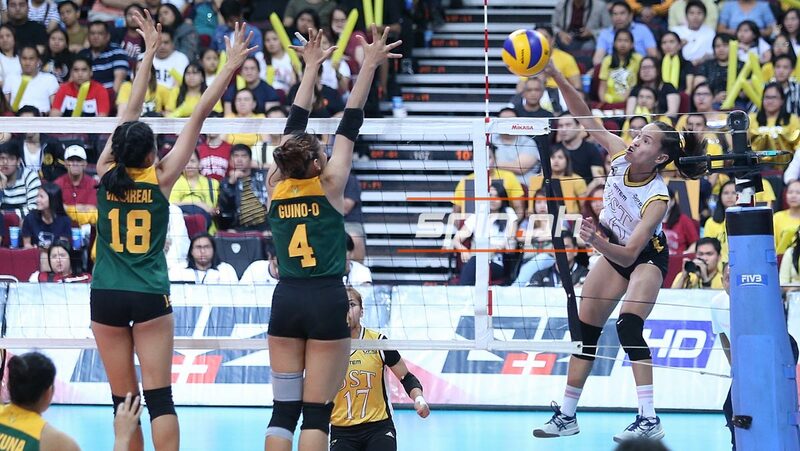 Even before the game both UST and FEU completed the Final Four cast as University of the Philippines bombed out of contention with a heart-breaking five-set loss to National University. But the Tigresses strengthen their chance for a twice-to-beat advantage with an improved 9-4 win-loss record just half a game behind second placer De La Salle (9-3). UST gave up 30 errors but outmuscled FEU in attacking with a 41-28 disparity and 11-3 differential in service aces. Heather Guino-o was the lone bright spot for the Lady Tamaraws with 14 points and led the comeback of FEU from a 14-20 third set deficit and took the 22-21 lead. But Rondina’s back row hit, KC Galdones blocked on Jerrili Malabanan and Celine Domingo’s crucial net touch let UST reached match point, 24-22, before Domingo made up for her mistake to save a point but Laure ended the match with a powerful hit. FEU still clinched its fifth straight Final Four appearance despite dropping to 8-5 card at fourth place. Both squads will take a Holy week break before their last elimination games with UST facing NU (4-9) on April 27, while FEU will take on La Salle on April 28.